A stepper motor is a type of DC motor that works in discrete steps. It is a synchronous brushless motor where a full rotation is divided into a number of steps. 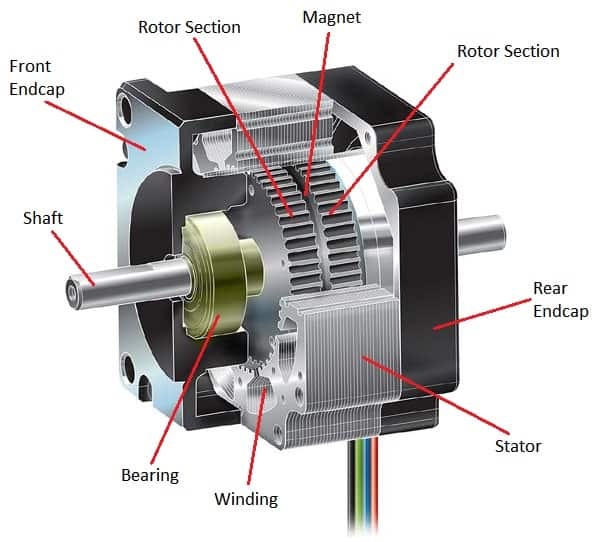 The two main components of a stepper motor are the rotor and the stator. The rotor is the rotating shaft and the stator consists of electromagnets that form the stationary part of the motor. When a discrete DC voltage is applied, the stepper motor rotates in a particular angle called the step angle; thus a stepper motor is manufactured with steps per revolution of 12, 24, 72, 144, 180 and 200, with a corresponding step angle of 30,15, 5, 2.5, 2 and 1.8. It can be operated with or without a feedback control. A stepper motor is a particular type of DC motor that does not rotate continuously. Instead, a full rotation is divided into a number of equal steps. A stepper motor consists of phases, which are multiple coils that are organized into groups. By applying the energy from the input voltage to each phase in a sequence, the stepper motor rotates by taking one step at a time. Thus a stepper motor converts electrical energy or an input digital pulse into mechanical shaft rotation. A stepper motor works under the principle of electromagnetism. A permanent magnet or soft iron is used as the rotor and is surrounded by electromagnetic stators. The poles of the rotor and stator may be teethed. When voltage is applied at the terminals, the rotor aligns itself with the stator or moves to have a minimum gap with the stator due to the magnetic effect. The stators are energized in a sequence and the rotor moves accordingly, giving a full rotation that is divided into a discrete number of steps with a particular step angle. Permanent Magnet Stepper Motor: Permanent magnet motors use a permanent magnet (PM) in the rotor and operate on the attraction or repulsion between the rotor PM and the stator electromagnets. Variable Reluctance Stepper Motor: Variable reluctance (VR) motors have a plain iron rotor and operate based on the principle that minimum reluctance occurs with minimum gap, hence the rotor points are attracted toward the stator magnet poles. Hybrid Synchronous Stepper Motor: Hybrid stepper motors are named because they use a combination of permanent magnet (PM) and variable reluctance (VR) techniques to achieve maximum power in a small package size. The indexer (or controller) is a microprocessor capable of generating step pulses and direction signals for the driver. In addition, the indexer is typically required to perform many other sophisticated command functions. The driver (or amplifier) converts the indexer command signals into the power necessary to energize the motor windings. There are numerous types of drivers, with different voltage and current ratings and construction technology. Not all drivers are suitable to run all motors, so when designing a motion control system the driver selection process is critical. The stepper motor is an electromagnetic device that converts digital pulses into mechanical shaft rotation. Advantages of step motors are low cost, high reliability, high torque at low speeds and a simple, rugged construction that operates in almost any environment. The main disadvantages in using a stepper motor is the resonance effect often exhibited at low speeds and decreasing torque with increasing speed. Precise positioning and repeatability of movement since good stepper motors have an accuracy of 3–5% of a step and this error is non-cumulative from one step to the next.